What and how people search is always changing. Voice search, in particular, is shaking up the world of inquisition and it’s happening fast. So fast in fact, that it is estimated that over 50% of searches will be from voice by 2020. Whether you personally use it or not, chances are your customer is or will be, and you need to be prepared to adjust for this in your SEO strategy. Speaking of SEO strategy, an efficient way to help search engines understand the content of your page better and faster is to implement structured data on your website. For example, if you want search engines to quickly understand that you sell tacos in the Minneapolis area between the hours of 11am-11pm, using a structured data snippet to tell search engines where to find that information could help your rank position significantly. And while you’re at it, be sure your page load time is super-duper quick. Your user is likely to bounce if load time is more than a second or two. A user may also bounce if your site has too many options to choose from in the navigation. Make your website clear, concise and intriguing. When developing digital campaigns, something that should be remembered is that a digital ad’s purpose is to drive users to the next step, not necessarily sell the product, but it does need to be memorable. In digital advertising, design needs to come first. Ads need to have thumb-stopping power. Consuming an ad begins with the creative. If the image is lazy, your ad will get skipped over as users scroll through posts at a rate of 1.7 seconds. Also, nearly half (47%) of the probability that an ad will even be looked at depends on the creative itself. If you’re looking to up your design but not sure where to start, we’ve got you covered. With news feeds being inundated with content, your content needs to be stellar and it needs to tell a story. In order for your content to be seen organically, especially on Facebook due to the algorithm change, it needs to be high-quality, relevant, have targeted keywords and context. A good social media strategy has a persona, measurable objectives, includes video, and plans for adjustments. When thinking about what platform to create a strategy for consider this: if you sell a product, you need to be on Pinterest. If you want to monitor customer service in real-time, Twitter is where you’ll gain valuable insights. Instagram isn’t just for pretty pictures; repurpose blogs and other content for the platform. We’ve been hearing about how important video is for social strategy for awhile now; so, since video content is king, figure out ways to repurpose other content in the form of a video. Whether it be a blog, an infographic, article, etc. Don’t be afraid to go live! Remember: good content = conversions. We gained tons of new nuggets of knowledge in the ever-evolving digital marketing industry and we can’t wait to research and implement our new ideas into our strategies. 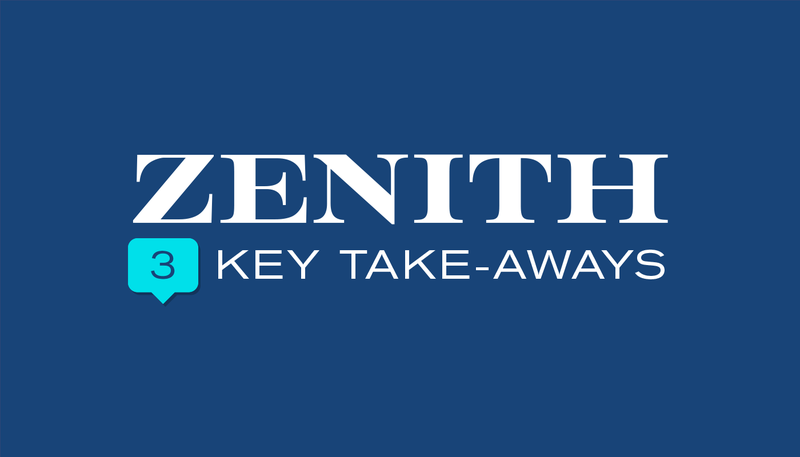 Did you attend #Zenith2018? What were some of your takeaways?